As Democratic leaders tentatively took impeachment proceedings off the docket this week, the White House put payback on the front burner — calling for closer looks into everyone from the FBI officials who investigated the Russia case to allies of Hillary Clinton’s campaign who solicited foreign help during the 2016 presidential campaign. “All those things have to be explored and more,” Trump lawyer Rudy Giuliani told “Fox & Friends” on Wednesday. On social media and in televised interviews, President Trump, his attorneys, his campaign and senior members of his administration have in the wake of the Robert Mueller report seemingly adopted a strategy of highlighting lesser-known episodes of alleged misconduct by Democrats and investigators, as Democrats pursue obstruction of justice inquiries. White House adviser Kellyanne Conway led the charge on Monday, openly wondering on Twitter why former FBI Director James Comey focused so heavily on the lurid and salacious claims in a largely discredited anti-Trump dossier. COMEY’S PAPER TRAIL: WHY DID FBI DIRECTOR KEEP HIGHLY CLASSIFIED INFORMATION IN HIS PERSONAL MEMOS? “Tables are finally turning on the Witch Hunt!” Trump also tweeted. The FBI is currently being sued by conservative group Judicial Watch, after the bureau failed to respond to a Freedom of Information Act (FOIA) request concerning contacts in late 2016 between the then-FBI general counsel and a top Hillary Clinton campaign lawyer, as well as contacts between the FBI and the author of the dossier. Comey briefed Trump on the salacious contents of the dossier in January 2017, ostensibly to make him aware of potential blackmail threats, Comey later testified. That confidential meeting later leaked, and CNN cited the fact that intelligence officials had briefed Trump on the dossier as a justification for airing the story, even though the dossier’s claims were unverified. Comey told lawmakers that then-National Intelligence Director James Clapper, an Obama appointee, came up with the idea to brief Trump on the dossier’s contents. Separately this week, Giuliani revived Republican-led calls to look into whether, and to what extent, a Democratic Party consultant worked with Ukrainian officials to dig up dirt on the Trump campaign. “Keep your eye on Ukraine,” he said Wednesday. A 2017 investigation by Politico found that Ukrainian officials not only publicly sought to undermine Trump by questioning his fitness for office, but also worked behind the scenes to secure a Clinton victory. Last month, Ukraine Prosecutor General Yurii Lutsenko opened a probe into the so-called black ledger files that led to Manafort’s departure, after a leaked tape recording apparently showed a senior Ukrainian anticorruption official admitting to disclosing Manafort’s information to help the Clinton campaign. A Ukrainian court later ruled that the move amounted to illegal interference in the U.S. election. On Sunday, Giuliani hammered the same theme. “Is it a crime for an American campaign to consider information from a foreign source or to obtain it?” he asked, responding to claims that the Trump team acted improperly by meeting with Russian-affiliated individuals who promised damaging information on Clinton. “If so the allegation that the DNC [Democratic National Committee] colluded with Ukrainian officials to generate information to hurt the Trump campaign and help the Clinton campaign must be investigated,” Giuliani added. Buoyed by Special Counsel Mueller’s findings that no member of the Trump team illegally conspired with Russia, Republicans have additionally turned to a separate known episode of apparent collaboration between a 2016 presidential campaign and a foreign national — specifically, the decision by Hillary Clinton’s campaign and the DNC to hire Fusion GPS. The firm, in turn, funded the infamous dossier, drafted by British ex-spy Christopher Steele, which contained numerous assertions that fueled an anti-Trump media frenzy — but that Mueller’s investigators were unable to substantiate. Democrats, too, heavily pushed the Steele dossier. At a 2017 hearing, now-House Intelligence Committee Chairman Adam Schiff, D-Calif., confidently described Steele as “a former British intelligence officer who is reportedly held in high regard by U.S. intelligence” and repeatedly cited “Steele’s Russian sources” as he described a purported Trump-Russia conspiracy. The article noted that Steele relied in part on Russian sources and that, ironically, the document could have been part of a “Russian disinformation” effort to smear Trump even as Moscow was going after Clinton. Internal FBI text messages obtained by Fox News last month showed that a senior Justice Department official warned of “bias” in a source key to a FISA application. The DOJ Inspector General is investigating whether the FBI violated its procedures or Page’s constitutional rights by withholding exculpatory information from the FISA court. “The Office of the Inspector General has a pending investigation of the FISA process in the Russian investigation, and I expect that that will be complete probably in May or June, I am told,” Attorney General William Barr testified earlier this month. House Intelligence Committee ranking member Devin Nunes, R-Calif., has already sent several criminal referrals to the Justice Department related to alleged crimes committed during the Russia probe, and Fox News is told as many as “two dozen” individuals could be implicated. It was unclear exactly whom had been referred. The Trump team’s pushback comes as top Democrats, including House Speaker Nancy Pelosi, have clamped down on calls to impeach the president. In a private Democratic conference call on Monday, two sources told Fox News, Pelosi said impeachment would be premature, and even anti-Trump firebrand Maxine Waters declined to call on her colleagues to begin impeachment proceedings. However, Fox News is told Democrats emphasized on the conference call that more investigations and fact-finding are necessary before any final decision can be made. Schiff, for his part, has already referred to a June 2016 Trump Tower meeting as “direct evidence” of collusion in plain sight. Schiff has only doubled down since Mueller’s report was published, calling for closer looks into Trump’s finances and contacts with Russians. Donald Trump Jr., his brother-in-law Jared Kushner, and Manafort were known to have attended the meeting with Kremlin-linked attorney Natalia Veselnitskaya, and the Trump team gave shifting explanations for the role of the president in drafting media responses to inquiries about the episode. But Mueller found that the meeting was not a criminal campaign finance violation, in part because there was insufficient evidence that the involved parties knew they were breaking the law — a high standard that applies only to certain crimes. Additionally, prosecutors said, it was unclear whether an exchange of information not available on the public marketplace could constitute a “campaign contribution” by a foreign national in the first place. Still, Schiff told Fox News that episodes like that meeting raised grave concerns, and indicated impeachment would be a “difficult” issue that would be addressed in a matter of weeks. In the dueling messaging wars, though, the Trump team has been nothing if not confident in recent days. Elizabeth Warren openly sparred with Amazon in a series of pointed tweets on Tuesday, just hours after she admitted during a nationally televised town hall that she still shops at the e-commerce giant — even though she wants it broken up, along with a slew of other major tech companies. Warren kicked off the spat on Monday by reiterating her argument that Amazon abuses its control over the Amazon Marketplace, which hosts third-party sellers, to improve its own retail operations and unfairly disadvantage the third-party sellers. In response, the official Amazon News Twitter account wrote Tuesday afternoon that third-party sellers have been doing better than ever. WARREN VOWS TO SPEND $640B TO PAY OFF STUDENT DEBT — WHAT ABOUT CREDIT CARD DEBT, VET BILLS, OR MORTGAGES?! The Massachusetts senator then cited “reports” that Amazon used third-party seller data to make its own products successful, and linked to Bloomberg News and Wall Street Journal articles on the topic. Warren also alleged that Amazon sought to “deliberately misconstrue” its near-50 percent market share in online retail, by instead using brick-and-mortar numbers. Asked at a CNN town hall on Monday to identify her last Amazon purchase, Warren said she bought a mailbox. In addition to Amazon, Warren previously said she wanted to break up Google, Facebook, and Apple. Speaking to The Verge at the South by Southwest (SXSW) technology conference last month in Austin, Texas, Warren specifically demanded that Apple must be forced either to surrender control over the App Store or to stop selling its own apps within it. Former White House counsel Don McGahn has been subpoenaed to testify publicly following the release of Special Counsel Robert Mueller’s report on the Russia investigation. Former U.S. assistant attorney and Fox News contributor Andy McCarthy reacts. The White House will fight House Democrats’ subpoena of testimony and documents from ex-White House counsel Don McGahn, Fox News is told — and almost immediately, House Judiciary Committee chairman Jerry Nadler, D-N.Y, characterized the move as “one more act of obstruction” by the Trump administration. The brewing fight over the McGahn subpoena was poised to set up a series of other contentious legal showdowns as Democrats seek to publicly question more current and former Trump aides who featured prominently in Special Counsel Robert Mueller’s report on the Russia investigation. Fox News is also told the White House intends to vigorously oppose subpoenas that might run up against executive privilege, a power sanctioned by the Supreme Court that allows the president and members of the executive branch to shield certain internal communications from disclosure, absent a compelling overriding justification. Neither the “presidential communications privilege,” which protects discussions by the president and senior aides, and the “deliberative process privilege,” which protects even lower-level talks concerning policy discussions, were invoked by the White House to redact any sections of Mueller’s report. But as Democrats ramp up their investigations following the report’s release, Trump and his team have begun pushing back on a campaign of probes they say are nakedly partisan. The White House scored an early victory in that effort on Tuesday, after House Democrats agreed to postpone a subpoena deadline for Trump’s financial records, following Trump’s lawsuit challenging the subpoena. In a statement Tuesday evening responding to reports that the White House would fight the subpoena, Nader called the subpoena “valid” and said he wouldn’t back down. 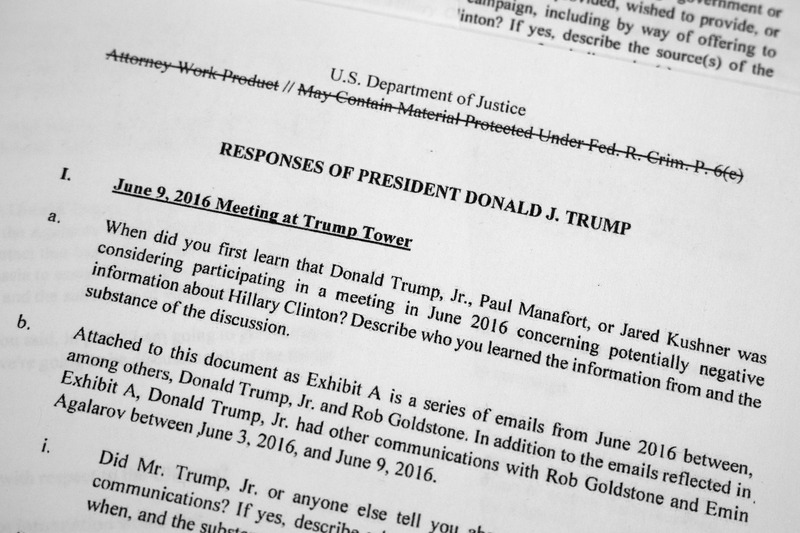 Mueller’s report contained purported conversations between Trump and McGahn that have raised eyebrows on Capitol Hill. Last week, Trump unleashed a series of broadsides concerning claims that his associates had given Mueller damaging information. John Dowd, who served as a member of President Trump’s legal team from June 2017 until March 2018, backed up Trump on “Fox & Friends” Monday. Fox News’ Samuel Chamberlain and Mike Emanuel contributed to this report. House Democrats have agreed to postpone their imminent deadline for President Trump to turn over years of financial documents pending a court ruling on his lawsuit to block such a release, handing a major victory to the White House and, for now, vindicating Trump’s decision to take the matter to court. Trump’s lawyers on Monday sued to block a subpoena issued by members of Congress to the accounting firm Mazars USA LLC for an array of Trump’s financial information, including annual statements, periodic financial reports and independent auditors reports. Mazars produced, among other documents, “statements of financial condition” for Trump before he became president, outlining his net worth in ways Democrats have charged may have been intentionally misleading. Trump’s suit named Rep. Elijah Cummings, the Democratic chairman of the House Committee on Oversight and Reform, and Peter Kenny, the chief investigative counsel of the House committee, as its plaintiffs. The complaint, filed in a Washington federal court, argued that the subpoena “has no legitimate legislative purpose”and is simply intended to harass the president. A hearing in the case has been set for May 14, and Democrats have agreed to delay the response date on their subpoena until seven days after the court issues a ruling. Separately, the administration defied a demand from Ways and Means Committee Chairman Richard Neal, D-Mass., to turn over six years of Trump’s tax returns by the close of business on Tuesday. Treasury Secretary Steven Mnuchin said in a letter to Neal on Tuesday that he was waiting for a Justice Department opinion on whether it is permissible to turn over the president’s returns to Congress without his consent, and that a final decision is expected by May 6. Mnuchin made clear in no uncertain terms, though, that the Democrats’ request was “unprecedented,” and that ordinary requests from Congress for taxpayer information were efforts to inform tax law drafting — not to expose the private information of a particular taxpayer. Mnuchin also argued that while Democrats claim they are acting in their oversight capacity, there has been an ongoing effort for several years, by various actors, to expose Trump’s returns “for the sake of exposure” and politicial gain. The Trump administration generally has signaled that Democrats’ efforts to obtain the tax returns will be fruitless. Acting White House Chief of Staff Mick Mulvaney had told “Fox News Sunday” earlier this month that Democrats would “never” see the returns. Mnuchin got into a fiery viral exchange with U.S. Rep. Maxine Waters, the Financial Services Committee chair, just weeks ago at a televised hearing that touched on the issue. Neal hasn’t announced next steps after sending two letters to IRS Commissioner Charles Rettig demanding Trump’s taxes. But he could opt next to issue a subpoena to enforce his demand, sent under a 1924 law that requires the Treasury secretary to furnish any tax return requested by a handful of lawmakers with responsibility over the IRS. 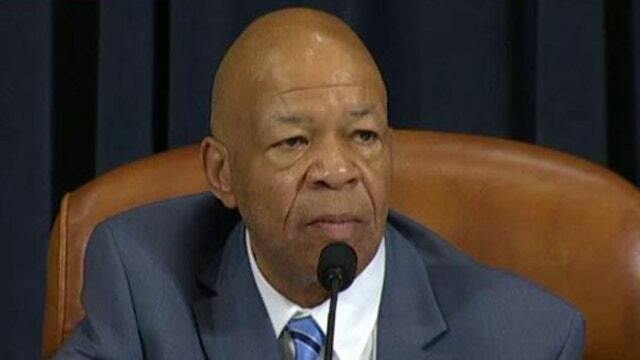 In another parallel congressional probe, Cummings, D-Md., has said the White House is in “open defiance” of his panel after lawyers advised a former official to ignore a separate subpoena related to the committee’s investigation of White House security clearances. He added the White House “has refused to produce a single piece of paper or a single witness” in any of the panel’s investigations this year. Democrats took control of the House in January. Cummings said he is consulting with other lawmakers and staff about scheduling a vote to hold former White House personnel security director Carl Kline in contempt of Congress after Kline did not show up on Tuesday for a scheduled deposition. The committee subpoenaed Kline after one of his former subordinates told the panel that dozens of people in Trump’s administration were granted security clearances despite “disqualifying issues” in their backgrounds. Fox News’ Bill Mears, Alex Pappas, Lawrence Edward, Mike Emanuel and The Associated Press contributed to this report. The comments from Sen. Ron Wyden, D-Ore., came as federal regulators are reportedly considering seeking some kind of oversight of Zuckerberg’s leadership of Facebook over the social network giant’s mishandling of users’ personal information, which may have violated an ongoing consent decree that legally requires the company to better protect user data. “Given Mr. Zuckerberg’s deceptive statements, his personal control over Facebook, and his role in approving key decisions related to the sharing of user data, the FTC can and must hold Mr. Zuckerberg personally responsible for these continued violations,” Wyden wrote. “The FTC must also make clear the significant and material penalties that will apply to both Facebook the corporate and Mr. Zuckerberg the individual should any future violations occur,” Wyden added. Discussions between Facebook and FTC officials about its data-handling lapses have touched on holding the CEO personally accountable, The Washington Post reported Friday. Zuckerberg controls a majority of Facebook’s voting stock and has run the company since starting it at Harvard in 2004. The Post quoted two anonymous sources familiar with the discussions. It said putting restraints on Zuckerberg could send a message to other tech giants that the FTC could hold their executives accountable for privacy misdeeds. “The days of pretending this is an innocent platform are over, and citing Mark in a large-scale enforcement action would drive that home in spades,” Roger McNamee, an early Facebook investor, told the paper. The FTC had no comment and Facebook did not immediately respond to a request for comment. The commission opened an investigation into Facebook last year after revelations that data mining firm Cambridge Analytica had gathered details on as many as 87 million Facebook users without their permission. The FTC has been examining whether that massive breakdown violated a settlement that Facebook reached in 2011 after government regulators concluded the Menlo Park, California, company had repeatedly broken its privacy promises to users, who now number 2.3 billion globally. The FTC decree, which runs through 2031, requires that Facebook get its users’ consent to share their personal information in ways that aren’t allowed by their privacy settings. The Post previously reported the FTC is considering hitting Facebook with a multibillion-dollar fine. That would top its previous record fine of $22.5 million, which it dealt to Google in 2012 for bypassing the privacy controls in Apple’s Safari browser. Facebook has in the past year been buffeted by media coverage highlighting what critics call a cavalier attitude toward protecting user privacy and data — and in failing to prevent the dissemination of hate speech and misinformation on the biggest communications medium in history. On Thursday, its Instagram subsidiary said in a blog post that millions more users were affected by a password security lapse than Facebook acknowledged when announcing the problem nearly four weeks ago. In the initial announcement, it had said tens of thousands of passwords were stored on the site in plain text, meaning company employees could search them. In a Post op-ed, Zuckerberg called for a more standardized approach to policing content, a common standard around verifying political actors prior to and during elections, the adoption of Europe’s data privacy legislation as a common framework and a guarantee of so-called data portability. However, Roger McNamee, who mentored Zuckerberg in the social network’s early years, said his proposals are disingenuous. Fox News’ Christopher Carbone and The Associated Press contributed to this report. McConnell has long framed the upcoming 2020 elections as a referendum on what he has called the “full socialism on display” from prominent Democrat Party members, including New York Rep. Alexandria Ocasio-Cortez and presidential contenders Bernie Sanders, Elizabeth Warren, Cory Booker, Kirsten Gillibrand, and Kamala Harris. On Monday, the longtime incumbent was positioning the Senate as a bulwark to defend capitalism, even in the event President Trump doesn’t win re-election in 2020. But it would be a grave mistake, McConnell warned Monday, to underestimate the threat posted by the “pervasive” rise of socialism. McConnell has also cautioned that Amy Klobuchar, a relative moderate 2020 Democratic contender who has called for a public option instead of universal Medicare, would similarly destroy the private insurance industry and cause major problems for the health care system. McConnell, who first became a senator in 1985, is up for reelection in 2020, and he formally launched his campaign last week by emphasizing his work on tax cuts and federal judicial confirmations. But Democrats, including Senate Minority Leader Chuck Schumer, D-N.Y., have reportedly sought to recruit a challenger, despite apparent long odds. Earlier this year, Matt Jones, a Kentucky sports radio personality who has weighed a bid against McConnell, told reporters that he wanted to see a new face in office. Last month, a campaign to enlist former figher pilot Amy McGrath to run against McConnell began fundraising. The stark comments from Rep. Elijah Cummings, D-Md., signaled that Democrats are not yet concerned about the possibility of “Russia fatigue” — the notion that after years of nonstop and largely discredited coverage concerning alleged collusion by President Trump associates with foreign nationals, Americans want to focus on other issues. It was unclear exactly what Cummings was referencing. But in the wake of Special Counsel Robert Mueller’s report on Russian election interference, which cleared the Trump team of any criminal collusion with Russian hacking and social media disinformation campaigns but did not “exonerate” the president on obstruction, Cummings was more circumspect on the possibility of impeaching the president. Other Democrats, including Ohio Rep. Tim Ryan, Maryland House Majority Leader Steny Hoyer, and House Speaker Nancy Pelosi, have also said impeachment proceedings would be premature. In the meantime, Cummings previewed new lines of investigation against Trump and said it might be necessary to hear testimony from former White House Counsel Don McGahn and Mueller himself. A section of the Mueller report outlined how Trump allegedly told McGahn to inform the acting attorney general that Mueller should be removed in June 2017 — a demand that McGahn ignored. Trump has strongly suggested that claim was ‘bulls—.,’ and on “Fox News Sunday,” Trump attorney Rudy Giuliani suggested there had been a misunderstanding. Speaking separately to “Face the Nation,” Utah Republican Sen. Mike Lee had a less-than-flattering take on the Mueller report’s assessment of the obstruction issue.